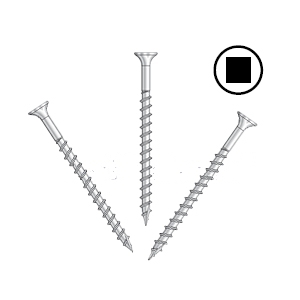 PRODUCT: #8 x 2" Tile Roofing-to-Wood Screws, 305 Stainless Steel, Strip Collated, #17 Sharp Point, #2 Square Drive. Simpson Quik Drive SSWSCB Series. 2000/Box. Price/Box. 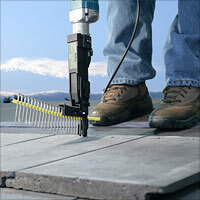 #7 X 2 Inch GRAY Lifecoat / ACQ All Weather Finish, Wood Deck Screw, #2 Phillips Drive, Flat Head, Coarse Thread, Sharp Point. ~153 screws/ 1-LB Box. Price/Box.